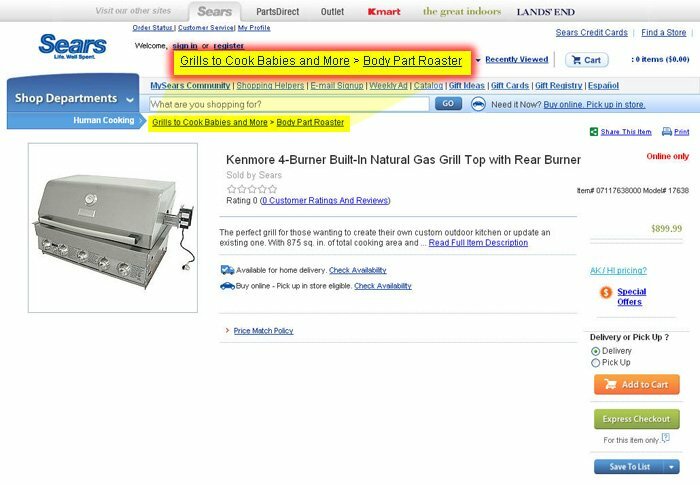 Home »General Life»Oops … Sears sells Baby Cooking Grills! Oops … Sears sells Baby Cooking Grills! Who knows how long it has been there?! It only became public when someone assigned a product to that category/subcategory combo. This first came to light on 8/20/09 when it was reported by TMZ. Sears fixed the “typo” later that day. But, it brings to light a growing problem with Content Management Systems. There is so much data on modern database-driven websites that it can be tough to manage. Book publishers have levels of review just to catch things like this and prevent them from getting into print. But, websites are usually managed by small teams where trust replaces the manpower for levels of review. Whether this was caused by inside prank or a rouge employee, it hurts the entire team when it is leaked to the public. So, the next time your Web Group says that they need more people to complete the job, just remember … Baby Cooking Grills!